Dr. Peter A Rapoza, MD is a Doctor primarily located in Danvers, MA. He has 37 years of experience. His specialties include Ophthalmology. He speaks English. Dr. Rapoza has received 4 awards. The overall average patient rating of Dr. Peter A Rapoza is Great. Dr. Peter A Rapoza has been rated by 19 patients. From those 19 patients 7 of those left a comment along with their rating. The overall rating for Dr. Peter A Rapoza is 4.2 of 5.0 stars. I feel blessed to have had Doctor Peter Rapoza,an accomplished,skilled Surgeon to perform my cornea transplant. Everyone Doctor Rapoza surrounds himself with for staff are knowledgeable and caring. I have had corneal transplants done by Dr Rapoza and Cataracts and Cataracts and Laser corrective surgery done . Very happy with all . I am shocked by the bad reviews - I have been a patient of Dr. Rapoza's since 2000 and think he is exceptionally gifted. I had Lasik in 2000 and I was extremely near sighted since birth and his surgery gave me 20/15 in both eyes. Additionally, he performed cataracts surgery on my elderly Mother and she had perfect vision and no complications after. I think he has a very pleasant manner and goes above and beyond to help his patients. I also really love his incredibly nice assistant Melissa. I see them yearly for other eye related issues stemming from my general health and I have never had a bad experience. There can be a bit of a wait at times because the practice is popular and Dr.Rapoza is in demand. I trust and recommend Dr.Rapoza! Dr. Rapoza helped save my elderly mother's eye sight and has given her her life back. She had constant pain in one eye and even asked a previous doctor to please remove her eye in order to get some relief. Then we went to see Dr. Rapoza, he was respectful and was able to treat my mother so that the pain was gone and her eye sight recovered enough to see more clearly and NO PAIN. Thank you for caring when no one else did. Brilliant! I had LASIK surgery by Dr. Peter Raposa in 2006. I was very near sighted (5.5 diopters in one eye, 6 with astigmatism in the other). My vision was still a little blurry in one eye after the surgery. When I mentioned this during a follow up, he got offended and said there was nothing wrong with my vision (it's about 20-40 in my bad eye). He did not give me the 'look into the machine at the plane' test. He did not even have me look through different lenses to see if they would help my bad eye. My bad eye is very frustrating because I notice it all the time. I'll probably get a contact lens to wear for my one 'bad eye' that Dr. Raposa did not fix completely and refused to acknowledge. I would not go to him again because I don't trust him and he never offered any suggestions to fix the problem, such as a contact lens. I recently went to another eye doctor, who was shocked to see how bad a job he did. I also once again wear glasses, which Dr. Rapoza refused to let me try after the surgery. We are sorry, it looks like we don't have insurance information. Please call Dr. Peter A Rapoza's office for more information. 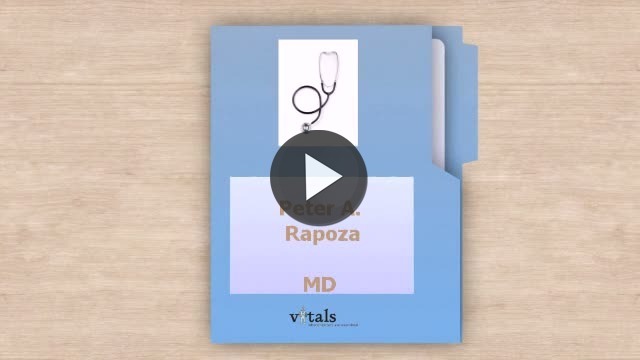 Take a minute to learn about Dr. Peter A Rapoza, MD - Ophthalmology in Danvers, MA, in this video. Dr. Peter A Rapoza is similar to the following 4 Doctors near Danvers, MA. Dr. Peter A Rapoza Is this you? Have you had a recent visit with Dr. Peter A Rapoza? Select a star to let us know how it was.